Tender butterscotch cake layers, with butterscotch frosting, butterscotch caramel sauce and marshmallow cream, make up this Harry Potter inspired Butterbeer Cake. We recently went back home to Southern California for a much-needed family vacation. 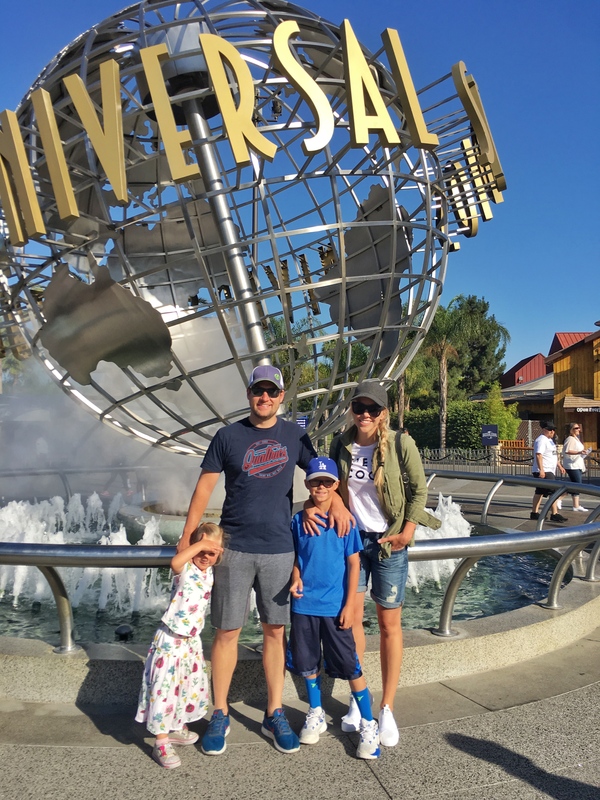 We spent a week at the beach, watched our beloved Dodgers play at Chavez Ravine, visited friends, and enjoyed a full day at Universal Studios. 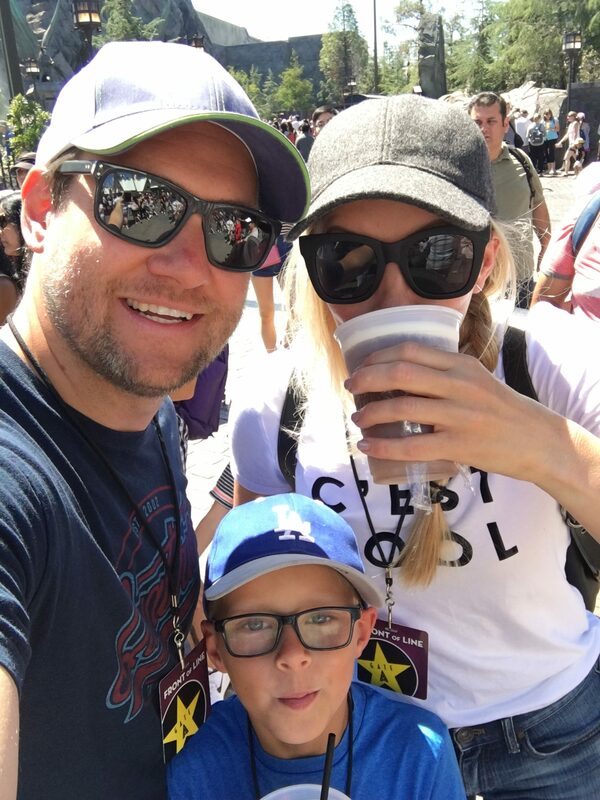 Universal Studios was definitely a highlight of the trip because it was our first time going to Harry Potter Land and experiencing Butterbeer. To be honest, I was a little skeptical that I’d like Butterbeer. I’m not a huge fan of butterscotch. But, WOW! It did not disappoint! We were advised by many to get the frozen version of the drink and it was absolutely delicious. So good, in fact, that we went back to Harry Potter Land a second time to get another round of drinks at the end of the day. As I drank my Butterbeer, all I could think about was how I could turn this amazing drink into a cake. Of course, there’s butterscotch, but I also loved the creamy foam on top. It tasted like marshmallow fluff! Once home, I got right to work on the cake. It took me a couple tries on the cake layers, but I’m so happy with the results. 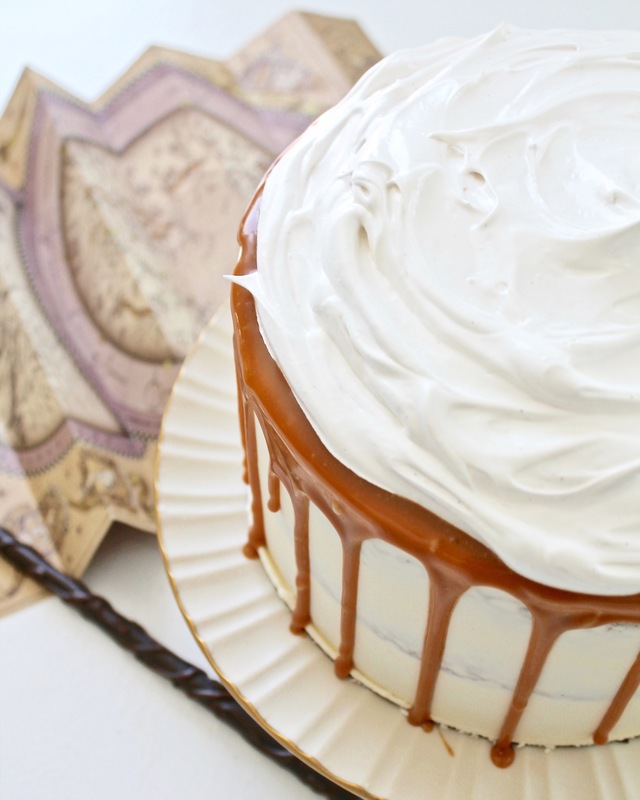 The cake itself is tender and moist, and full of butterscotch flavor. The key to making the cake so light and fluffy is the mixing time at the beginning. After you’ve added the eggs to the butter and sugar, make sure to mix on medium-high speed for a while. But when it’s time to add the dry ingredients, turn the mixer to low and keep your mixing time short. The drip on this cake is a little different than other drips I’ve done. I first tried adding heavy cream to my butterscotch chips but felt like that took away from the butterscotch flavor. I then tried butterscotch sauce, like the kind you pour on ice cream, with my butterscotch chips to make the drip and was much happier with the outcome. The drip is a little thicker and more like caramel, so I actually used a spoon to pour it over the sides of the cake. I also added the butterscotch caramel sauce in between each layer too. And to resemble the drink even more, I added homemade marshmallow cream to the top of the cake! 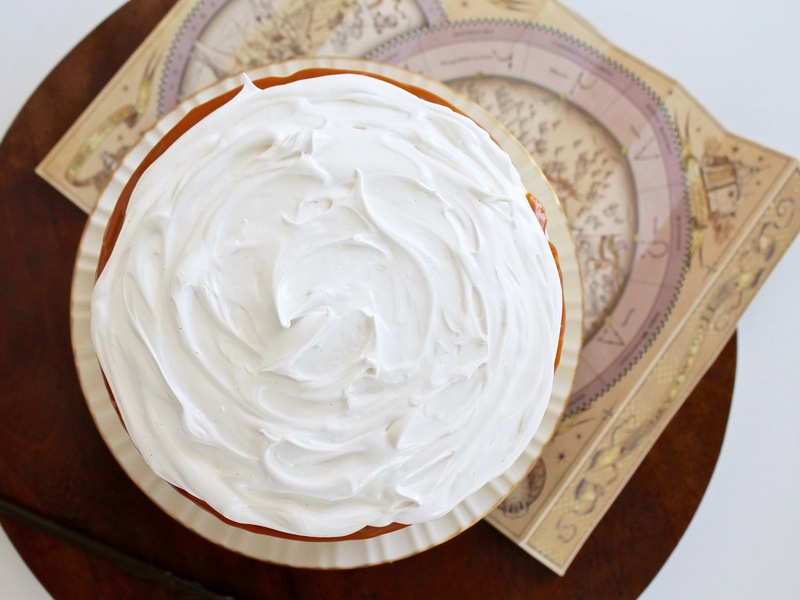 I hope you love this Butterbeer Cake as much as I do! 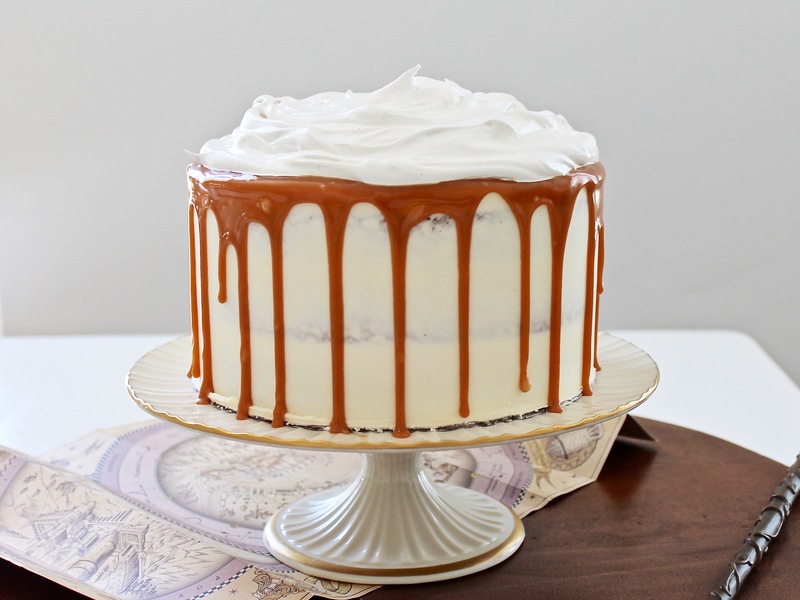 Butterscotch cake layers with butterscotch frosting, caramel butterscotch drip and marshmallow cream. Preheat your oven to 350 degrees F. Prepare three 8-inch round cake pans by spraying each pan with non-stick spray, covering the bottom of each pan with parchment paper and spraying the parchment paper with non-stick spray as well. Set aside. In the bowl of a stand mixer fitted with the paddle attachment, combine the butter and brown sugar. Mix on medium speed until light and fluffy, about 2 minutes. With the mixer on medium speed, add the eggs one at a time, mixing for about 30 seconds and scraping down the sides of the bowl between each addition. Add the butterscotch flavor and then turn the mixer to medium-high and beat for another 3 to 5 minutes until the batter has lightened in color and is fluffy in texture. Turn the mixer to low speed and gradually add the dry ingredients and buttermilk alternately, starting and ending with the dry ingredients. Mix until incorporated, only about 20 seconds. Scrape down the sides of the bowl and mix on low for another 10 to 20 seconds. Divide batter evenly between the pans, about 13 oz. of batter in each pan. Bake for 20 minutes, or until a toothpick inserted into the center of the cake comes out clean. Let the cakes cool in the pans for 10 minutes and then invert onto wire racks to cool completely. Level each cake layer before assembly. If you're not using the layers right away, wrap each cake layer with plastic wrap and freeze. In the bowl of a stand mixer, fitted with the paddle attachment, beat the butter on medium speed for about 2 minutes, until light and fluffy. With the mixer on low speed, slowly add the powdered sugar, followed by the vanilla, butterscotch flavoring and heavy cream. Continue to beat the frosting on medium-high speed for an additional 5 minutes, until the mixture has lightened in color and texture. Before frosting your cake, make sure to use a wooden spoon to beat the frosting by hand to push out any air pockets. In a small microwave safe bowl, heat the butterscotch sauce for about one minute. Pour the sauce over the butterscotch chips and allow to sit for a few minutes. Stir to combine. I recommend making the marshmallow cream last, near the time you're serving the cake, so it's fresh and stays puffy. In the bowl of a standing mixer, whisk the eggs and salt until fluffy and frothy. Meanwhile, heat the sugar, corn syrup, water and vanilla paste. Heat over medium flame until the sugar is dissolved and just simmering, about 5 minutes. Eventually, all of the sugar will be added and then turn the mixer up to high. Beat the mixture on high for about 5 minutes or until very stiff and shiny. Place your first cake layer, top side (leveled side) up, on a cake board. Spread about one cup of frosting on the cake layer, creating a little rim around the edges with your offset icing spatula. Pour about 1/4 cup of the drip/butterscotch caramel sauce on the frosting and spread evenly. Place the next cake layer, also top side up, on the filling. Spread another cup of frosting on the cake layer, followed by more drip. Place the final cake layer, top side down, on the filling and coat the entire cake with a thin coat of frosting to lock in the crumbs. Remember, this coat of frosting does not need to look pretty, It's just a thin layer of frosting to hold the crumbs in. Freeze the cake for 10 minutes. After the crumb coat is set, continue to frost the rest of the cake. 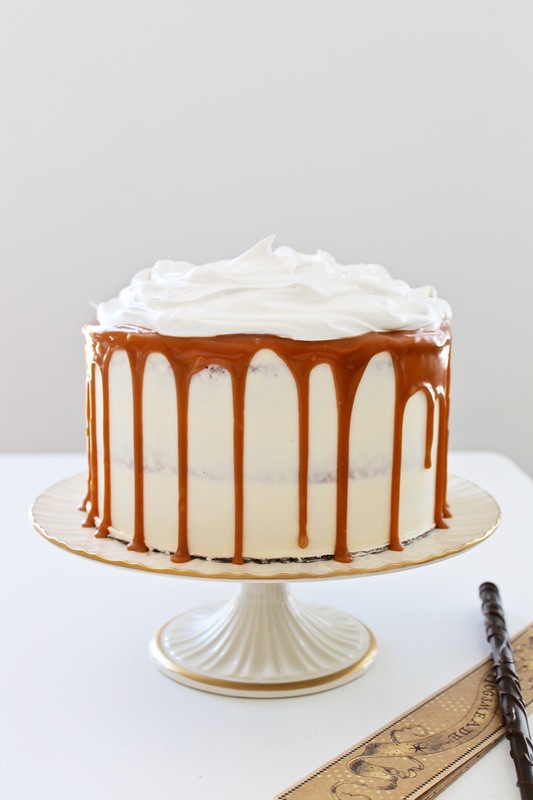 Using a spoon, pour the remaining butterscotch caramel sauce over the edges of the cake. Top with the marshmallow cream and enjoy! Cake can be frozen in an airtight container for up to a week. Serve at room temperature. Hey! I have a question about this cake…I creamed my butter for the cake, added eggs as directed and everything looked great…until I added my cream soda. Everything curdled and no amount of mixing could save it. Do you know what I may have done wrong? I added it slowly and became so disappointed! I’m excited to try to again if you have some good suggestions for me. Thank you! Oh now! I’m so sorry to hear that. It’s important to beat the sugar, butter and egg mixture really well (about five minutes). You want to make sure that mixture is completely creamed together before you add the cream soda. Once you add the cream soda, you need to mix again for about 5 minutes (sounds like you did). I wouldn’t worry if it separates a little once you add the cream soda because the flour will help bring it back together. If you’re worried about it happening again, you can always replace the cream soda with buttermilk. Hello! OMG, this cake is adorable! If I am wanting to just make a butterscotch cake, what can I replace the cream soda for? I really enjoy your blog! I made this cake and the flavors were good but the cake itself was crumbly and very dense. I followed it exactly but I did freeze the cake layers. Could that be why? Hmm, that’s strange. Crumbly cake usually means it’s dry, and overbaked a little. But freezing the cake shouldn’t make it dense. This cake should be light and fluffy. Your oven might run hotter, and you need to cut off a couple minutes of baking time. Thank you so much for your notes. I think it’s a great idea to switch out the cream soda for buttermilk. I didn’t have a problem with it, but since it’s been an issue for others, it’s worth changing. So excited to try this! I plan on bringing it to a Harry Potter themed party. Just one question – What method did you use for adding the marshmallow cream? That will be so fun. I just used a spoon to spread it out.